IRRCi Research Award Submission Deadline is October 6, 2017. Two categories: Practitioner and Academic. Winners to Receive $10,000 each and get to present at the 2107 influential Columbia University Millstein Center Forum. The Investor Responsibility Research Center Institute (IRRCi) is accepting submissions through October 6, 2017, for its sixth annual competition for research that examines the interaction between the real economy and investment theory. Practitioners and academics are invited to submit research papers by October 6, 2017, for consideration by a blue-ribbon panel of judges with deep finance and investment experience. Two research papers – one academic and one practitioner – each will receive the 2017 IRRCi Research Award along with a $10,000 award. The winning papers will also be presented at the Millstein Center for Global Markets and Corporate Ownership at Columbia University in December 2017 in New York City. Biographies of the judges are available here. Additional judges may be added. Last year’s two winning papers both offered important contributions to the global debate on the need for businesses to maintain a long horizon focus in a short-term world. But whether it is investor time frame, sustainability concerns or insider trading in the derivatives markets, the papers have constantly been high quality. That, in turn, has attracted widespread attention to the winning papers. Award submissions are accepted online. Submissions may be an original work created specifically for the IRRCi Research Award, or relevant unpublished papers, or papers that have been published after July 1, 2016. 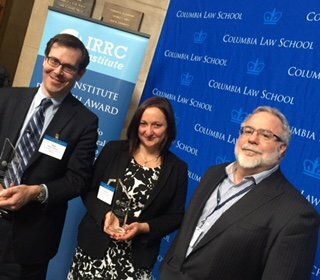 Winning papers will be presented at the Columbia University Millstein Center’s conference, published by the IRRCi on its website, and distributed to some 6,000 individuals interested in the organization’s research.